There are few sporting events as thrilling and exciting as the NFL combine. This event sees the best of the best in college football and is taking place this year at Lucas Oil Stadium in Indianapolis. Scouts from the NFL will observe players competing and showing off their skills in various drills such as the broad jump, bench press, the 40-yard dash, and other drills that will push their limits. A great performance here can be the difference between a career ending in college and someone becoming an NFL superstar. Naturally, you are going to be the superstar which is why you should be training for the combine with a pair of POWERHANDZ gloves. Our POWERHANDZ family knows you have what it takes to elevate your skills, so we have crafted our gloves to help you get there. Training with us will ensure that you are ready to master and crush each and every combine drill. Our gloves will help you build muscle and increase your strength due to the light-weight on your hands. Whenever you workout with them on, your muscles will be under extra strain, encouraging more growth. Eventually, this extra boost adds up giving you a leg up over everyone else who didn’t train with POWERHANDZ. Use our gloves to become the strongest player on the field, both physically and through your kinetic chain. With a strong kinetic chain, your athletic capabilities are limitless. Aside from strength, speed is the other major factor every scout will be looking for. In fact, some sports professionals believe that speed is more important to the game than strength. When you train with our gloves, your speed will increase. You’re probably wondering how that is exactly, “how will gloves help me to get faster?” The science behind it is pretty cool actually. As we stated before, the gloves have extra weight on them. When you train with this extra weight, your body will at first tire but eventually get used to moving around with the added heft on. This means once you take them off and hit the ground running without the weight, you will move faster. Take your speed to the next level with our gloves. Basketball might be known for players jumping superhumanly, but football has had its fair share of leaps of faith. We’ve all seen those killer videos of players leaping out of the way or jumping over charging players to score a winning touchdown. If it wasn’t important, why would they include jumping drills in the combine? Your ability to jump and your overall agility will be elevated when you use our POWERHANDZ gloves. Don’t just overpower and outspeed the competition, smoke them with your agility. You can have the best physical abilities in the world but they won’t mean anything if you don’t have the confidence to back your skill up. Studies have found time and time again that when an athlete is confident they get better results out of their game, no matter what it is. You need to walk into the combine knowing your trained to be the best and are going to demolish anyone standing in your way. At POWERHANDZ, we take pride in athletes using our gear to reach their full potential. We don’t just specialize in football but in other sports too including basketball, baseball, MMA, and more. Our amazing products will help you work out better and achieve physical excellence. It doesn’t matter if you want to become the next Tom Brady or just to improve your physical health. We are here to make it happen! 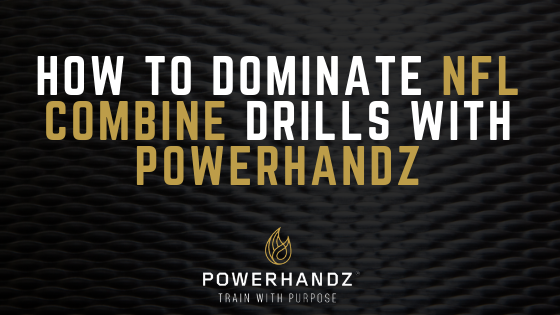 To learn more about POWERHANDZ and becoming an athletic legend, check out our blog.